Workers are non- executive employees of the organization. Percent wise, they constitute largest number of employees in the organization. 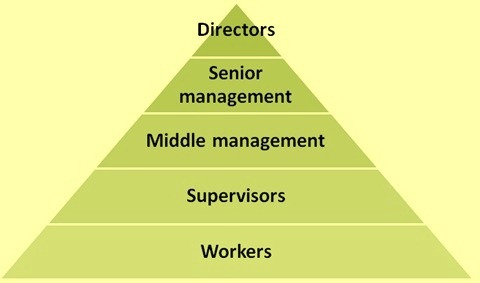 In the pyramid of the organization structure, the workers occupy the bottom most place which is below the supervisor level. Workers are so called since they are those of the organizational employees who physically carry out the work in the organization and who implements the plans made by the organizational management. For doing it, workers work with various tools, equipments, instruments, implements and processes. The performance of the organization depends on how efficiently the workers perform their work. In nutshell the workers are the back bone of the organization and healthy, well trained, knowledgeable, disciplined, motivated, safe, alert, honest, and hardworking team of workers help the organization to prosper and grow. The traits, which the workers need to personify, include teamwork, integrity, commitment, and work ethic. In different countries, the definition of a worker varies depending upon the culture of the country. However, generally a worker can be defined as a person employed in the organization to carry out manual, unskilled, skilled, technical, operational, clerical, or certain category of supervisory work in lieu of a compensation package. It excludes employees who are employed in the organization in the managerial and supervisory levels. Defining of work is not an easy task as it appears to be. Work is what the workers do to earn a livelihood. Work is best described as sustained activity whose purpose is the accomplishment of goals. Developments at the technological front in the recent past have necessitated rising levels of education of the workers and now greater challenges and skill requirements are expected from them. The job performed by the workers these days is much different from the job performed by the workers in the past. Due to this reason, manual labour content of the job has reduced a lot. In the present day environment, enhancement in the skill is more important for the workers in order for them to perform well at the workplace. A driving force behind the change in the skill requirements of the workers is the continuing process of technological innovation. Its impact on work quality promotes continual debate. Many present day workplaces are safer and more comfortable. The automated technologies of today have reduced requirements for physical labour. But skill requirements have not uniformly changed since the increased in the automation level has decreased variety and the opportunity for creativity needed from the workers. Computerized technology has resulted into significant job upgrading, more freedom, more job challenge, but it has also done the opposite since the button pushing and machine watching are not very interesting for the workers, often it is quite monotonous. Present day organizations require workers (i) to join and to remain with the organization, (ii) to carry out job assignments dependably, (iii) to regularly meet the targets with full confidence, (iv) to achieve organizational objectives beyond the job assignment through innovative and spontaneous behaviours, (v) to cooperate with management, supervisor and fellow workers, (vi) to work safely in order to protect the organization against disaster, (vii) to make creative suggestions for improvements, (vii) to carry out self-training and training of junior workers, and (vii) to create a favourable and peaceful environment at the workplace. Workers have normally three types of attitudes. These are (i) work values, (ii) job involvement, and (iii) job satisfaction. Work values have been found to vary with occupation, education, gender, and age. Blue collar workers focus on economic factors while white collar workers emphasize such intrinsic factors as interesting work and opportunities to develop abilities somewhat ahead of economic factors. However, the differences between occupational groups are not very large and are associated largely with education level. In the present day situation, there are workers whose work values are different from the traditional definition of a good job consisting of steady work, good pay, comfortable and safe working conditions, and possibly an opportunity to get ahead. This present day workers take these things for granted and demands, in addition, freedom, interesting and challenging work, and a voice in what goes on. These workers believe that they are entitled to a good job. Many of the workers today find the incentive systems so unappealing that they are not motivated to work hard. Job involvement attitude is often called work commitment and sometimes as employee engagement. It is defined as the workers’ identification with the job. That is, the degree to which the job is a part of their self-identity. Job involvement has been shown to be associated with absenteeism, turnover and the intent to leave. It is obvious that more and more people want jobs. But only a few percent of all the workers find their work more important to them. Wanting a job and being willing to work hard are clearly separable things and undoubtedly differ more for some workers than others. Job satisfaction depends on the likeness of the workers for their job which in turn depends on the discrepancy between the workers’ values and what the jobs provide them. Job satisfaction helps workers’ engagement towards their jobs. Like any other position in the organization, the positions of workers are also important positions. The workers play very important role in the organization. They need to have positive attitude towards the work. They are to concentrate on the work and enjoy the work. The responsibilities which the workers need to have and the role which the workers are to play in the organization, include the following. Workers need to have positive attitude at the workplace. Positive attitude towards work helps the workers to give enhanced performance and higher output. Workers are to be loyal to the organization. They are to avoid situations of conflict of interest with the organizational management and must not use confidential information for personal advantage. Workers are to listen to their supervisor. They are to listen to their fellow workers. They are to work with their supervisor and their fellow workers as a team. At the workplace, workers are to concentrate on the job without getting distracted with what is happening around them. However, they are to keep their eyes and ears open, so that they can notice any abnormality in the equipment and process during their work. Workers are to take the training opportunity provided to them by the organization very seriously, since it provides them opportunity to develop skills for the job. Workers are to continuously enhance their skills and continue to learn from the experience on their job. They are not to restrict themselves to one skill but learn several related skills which are needed for other jobs around their job. Multi-skilled workers are normally assets to the organization. Workers are to continuously enhance their knowledge so that they acquire the abilities and are in a position to step into the role of a supervisor. Workers are to be well informed. They are to understand all the communications which the organizational management conveys to them. They are also to be aware what is happening in their area of work in the industry. Workers are to build good relations with their colleagues, supervisors and middle level managers with whom they come in contact with. Workers are to be punctual. In case of shift working, they are to come to the job slightly before the shift starts so that they can understand the behaviour of equipment/process during the previous shift. Workers are to plan their daily work along with their supervisor and colleagues so that the targets for the shift/day are met. Time management is an important aspect in which workers need to have the necessary skills. Workers are to work on their job efficiently since the time available for the target output is always limited. Workers need to have a sense of responsibility towards the resources available in the organization. They are not to waste the resources and put all their effort to conserve them. Reduced consumption of resources for the same output improves the organizational profitability. Workers are to strictly comply with the work procedures and work instructions for the smooth functioning of the processes. Missing certain steps of the procedures can disturb the process or damage the equipment and can affect the output. Workers are to be disciplined. They are to not only follow the organizational discipline but also stick to the technological discipline required for the production process. Technological discipline is very important since without it, the process gets disturbed and equipments can have break-downs. Workers are to keep the working area neat and clean and to ensure that the equipments are well maintained. Working area not kept up properly and not well maintained equipment can become source of accidents. Following of the safety instruction at the workplace is a must for avoidance of accident and injuries. Workers are to use proper personal protective equipments at the work place. They are also not to wear loose clothing and clothing made of combustible materials such as polyester, nylon etc. at the workplace. Use of helmets and safety shoes at the workplace are also a necessity. Workers need to have enough communicating skills so that they can communicate properly with their supervisor as well as their fellow workers. Workers are to log the data generated during the work correctly and sincerely. The data logged by them is later used for analysis for not only for monitoring of the performance of the equipment and process but also solving of different problems when they arise in the process. Workers are to play their role as members of improvement initiatives like quality circles, suggestion schemes etc. Their active participation in these initiatives helps in solving many problems which they face during their day to day working. Workers need to have appropriate workplace behaviour so that there is peaceful atmosphere at the workplace. Harmonious relations at the workplace ensure stress free working which in turn helps in their enhanced output. Workers need to know the required decision making and the problem solving techniques, since during the course of the daily work, many conditions can arise where they are required to take decisions. Also they are required to solve many workplace problems sometimes alone while at other times with the help of their supervisor or fellow workers. Workers when they notice any abnormality in their area of work must share the same with their supervisor since a small abnormality can cause a bigger problem later. In case of any grievance, the worker is to bring the same to the notice of the supervisor so that a solution can be found. Not sharing of the grievance can increase the stress level of the workers. Motivated and satisfied workers promote a healthy culture at the workplace as compared to the demotivated workers. In the successful organizations, the workers are willing to accept challenges and learn something new each day. The roles and responsibilities are delegated as per the interest and specialization of the workers and thus each one tries hard to perform better than the fellow workers. Such organizations follow a strong culture as workers are serious about their work and abide by the policies. However there are certain organizations where things are being imposed on the workers. They are somehow be forced by the management to perform their duties. In such organization, team leaders are to be appointed to monitor their performance and make them work. In such cases there is a weak work culture at the work place. Aggressive work culture at the workplace promotes healthy competition amongst workers. In such workplaces, workers try hard to win the appreciation of their superiors. In such places innovativeness in the work can be easily noticed. Workers perform much better in such environment since their good work gets recognized in some way by their superiors. Constant disputes, disagreements, leg pulling lead to a negative ambience at the workplace. Workers find it difficult to concentrate in such a culture and look for a change. Organizations which have positive work culture at the work place have motivated workers who like their workplaces. Such organizations work very efficiently.